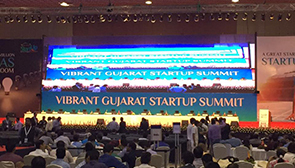 After the grand launch of the ‘Start-Up India’ movement on 20th to 21th of October 2016 at Mahatma Mandir, Gandhinagar, continuing to celebrate the spirit of entrepreneurship, Government of Gujarat is hosting a two-day event full of experiential networking and learning for start-ups and aspiring entrepreneurs. The event will include a notable line of expert speakers addressing to a great diversity of attendees on some topics critical to inspiration and innovation - targeted specifically to the interests, challenges and opportunities for entrepreneurs. The event is designed to act as a venue for successful business leaders and entrepreneurs to come together and benefit from the knowledge gained by connecting with like- minded individuals, in turn creating the most compelling environment for business opportunities. In order to take a step forward in the process of boosting start-ups, a selected few start-ups will get a chance to pitch their business plan to the investors as well. The Hon’ble Chief Minister of Gujarat will be inaugurating the summit in the presence of other dignitaries from Government, Business Leaders, Economists, Academicians, and Policymakers.